The BVP80 series has been discontinued. Please contact our Flow Engineering department. The pneumatic actuators on the BVP/BVPS80 and BVP/BVPS70 Series offer the latest technology for pneumatically actuating BV80 Series ball valves with NPT threads and BV70 Series with compression fittings. The BVP80 and BVP70 Series are a combination of the three key elements for long, reliable, trouble free life-a premium quality ball valve, a quality actuator designed to meet the torque requirements of the valve, and a mounting system which assures alignment and rigidity. The BV80 and BV70 ball valves low operating torque makes possible a compact actuator that is both economical to install and operate. Precise machining of all the valve components, including the seats, controls the sealing preload. This assures bubble-tight sealing, minimizes the operating torque and optimizes the valve life. The mounting system precisely couples the actuator drive shaft to the valve stem. Additionally, the valve stem nut is fixed within the actuator shaft. These features combined with a rigid mounting bracket, results in a pneumatically actuated ball valve which minimizes backlash, assures optimum stem seal life and eliminates any possibility of stem nut backing off while in service. The BVPS80 and BVPS70 Series offers a spring return model requiring only 50 psi supply air that can spring to open or close without loss of output torque from the air operated side. This is achieved by two opposing lightweight Zytel® or manufactured aluminum housed spring modules that are fully compressed by air operated diaphragm pistons. All BVPS80 and BVPS70 Series are designed to operate using an air supply of 3.5 to 8.6 bar (50 to 125 psi). 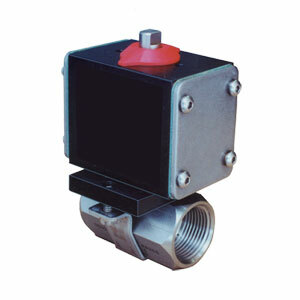 The air can be delivered by direct mounting pilot valves having NAMUR interfaces or from remote pilot valves connected via means of 1/8 NPT female threaded orifices in the actuator face plates. Caution: Care must be taken to assure that the output torque of the BVP80 Series actuator selected is adequate to turn the valve or device to be operated. A Limit Switch accessory is offered for the pneumatic actuators. The BVLS limit switch is easily mounted to any pneumatic actuator and provides a means to remotely display valve position or to interconnect the valve with related equipment such as pumps or other valves. The limit switch accessory utilizes two mechanical SPDT (single-pole, double-throw) micro-switches that respond to actuators' fully open or fully closed position by means of a cam fitted to the actuator top shaft. The switches are rated at 10 A, 250 Vac max. The limit switch is totally enclosed and may be used in applications where a dust tight or weather tight enclosure is required as well as in those locations where general purpose enclosures will serve. The housing, like our pneumatic actuators, is made from 6061-T6 aluminum and has a PTFE impregnated hard-anodized surfaces to enhance corrosion resistance. The BVE80 and BVE70 Series electric actuated ball valves are a compact mounting system that assures rigid and precise coupling of the actuator to the valve. The unique system features machined alignment brackets oriented with precision locator elements that serve to absorb the reaction torque independent of the mounting bolts. The end result is a system that eliminates the common problem of the mounting bolts loosening while in service. Additional features include thermal overload protection and manual override. Power: 3.4 to 8.6 bar (50 to 125 psi) air. Sufficient air delivery must be available at the actuator to ensure dependable operation. The following precautions should be observed: Air supply should be clean and free of moisture. When dirty or wet air is a problem; a filter/separator should be specified; these units are most effective when installed as closely as possible to the actuator. A filter, when used, should permit a minimum flow of 4 scfm at an upstream pressure of 4 bar (60 psi). Eliminate severe restrictions to air flow (certain solenoid valves and fittings). The most restricted passage must have an area no smaller than 0.012 in2, the area of 3 mm (1/8") diameter orifice. If more than a single actuator is to be supplied by an individual pilot, the minimum passage requirement applies per actuator. Tubing: For short runs up to 1.5 m (5'), 4 mm (5/32") I.D. is suitable, 6 mm (1/4") I.D. will serve up to 9 m (30'). For longer runs, use 10 mm (3/8") I.D. or larger. BVP80 and BVPS80 include solenoid valve.